Pros leave divots when they hit down and through the ball correctly. If you're a beginning golfer, chances are you've learned to sweep under a ball in order to get it airborne. That philosophy couldn't be further from correct. Solid contact requires that you actually go down and through the golf ball. By doing this, you are essentially making contact with the ball before your club hits the ground. It's a swing that takes practice to master, but the benefits can be seen in longer, straighter irons and even the potential of backspin on landing. Bring the club to the halfway point of your backswing, making sure that your lead arm is creating a 90-degree angle with the ground, the shaft of your club at vertical. Continue holding that sharp angle into the finish of your takeaway and back down toward the impact point. Allow your lead hand to control the swing of the club through impact, hitting down into the ball and then taking turf on the way back up into the follow-through. Keep your lead arm firm and allow your lead hand to be 2 to 3 inches past the club head when it makes contact with the ball. 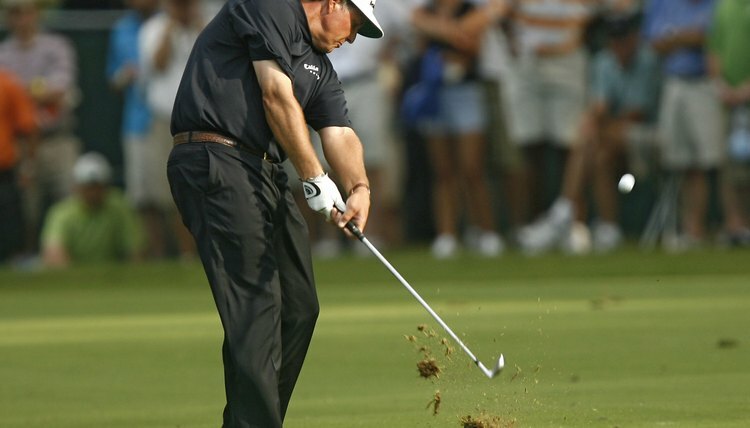 Keep your lead arm firm as you hit through the ball, take a divot and finish your follow through. How Do I Hit a Golf Ball in the Air?